Ultra low-fi rock music is usually indicative of one of two creative starting points. To wit: 1) The Pavement Scenario – a studied, deliberately nuanced tool utilised to convey a particular feeling within a narrowly-defined set of parameters; or 2) The It Was Recorded On My Own In My Bedroom Scenario, where the song was recorded by a someone in their bedroom. 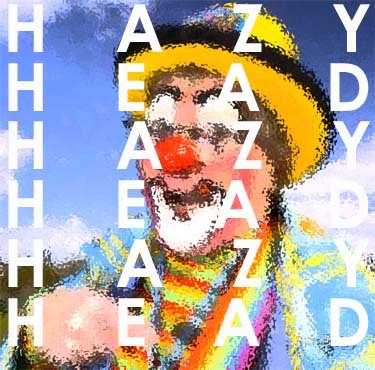 Clowns by Hazy Head is the latter. This also explains why no photographs of Hazy Head exist. This is a song that could not exist in any other state other than the one in which it inhabits here, and thus is the defining, beautiful thing about it. When it all falls apart right at the end and Clowns collapses over the finishing line under the weight of its own fragility, it’s tempting to blame amateurism, but this would be, of course, grossly unfair, as Hazy Head is actually an artist demonstrating precise control over his art. Because Clowns is one of those rarities – a bedroom pop song that is a minor joy to behold; all self-taught through small failures and smaller victories. The result is glistening new sounds, exciting slight-returns to old ones, and a sense of feeling that is absent from most shimmery pop songs. Nice, in the best possible way. Posted on February 21, 2012 by Joe Sparrow. This entry was posted in Headline, Today's New Band. Bookmark the permalink.